Port-to-shelf logistics services for large retailers and consumer brands. SalSon has terminals near all major East Coast and Gulf Coast ports, providing asset-based drayage and full transload capabilities. SalSon Logistics will soon have 250,000 sq. ft. of Class-A warehouse space available less than 1 mile from Port Newark. Dedicated Fleet and Final Mile Delivery. Some of the world's largest retailers and brands rely on SalSon for dedicated fleet services and final mile delivery. Services are delivered by SalSon people on SalSon equipment. We own 1,200 chassis, 600 trucks, and 1,200 trailers to give you the capacity you need, when you need it. We’ve got big-company resources but a lean management structure that allows fast decisions and, more importantly, fast action. We are a company of can-do problem solvers. Fast, flexible and relentless in pursuit of the right solution for you. We not only get it, we get it done. 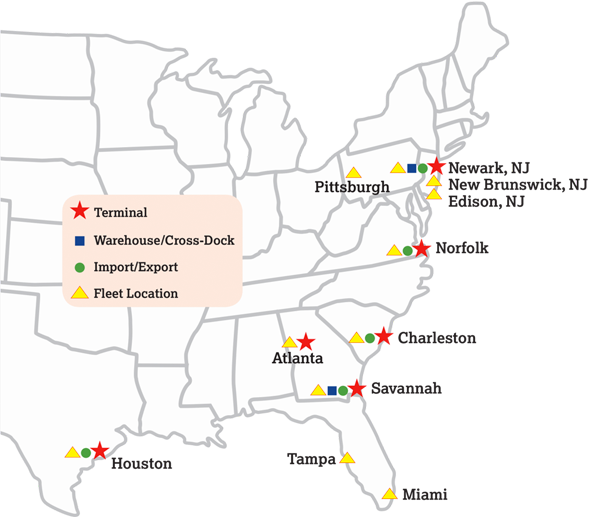 SalSon is headquartered in Newark, NJ, with terminal locations at all major East Coast and Gulf Coast ports. Our Dedicated Transportation service is run out of Greater Atlanta, with fleet locations throughout the Eastern U.S.